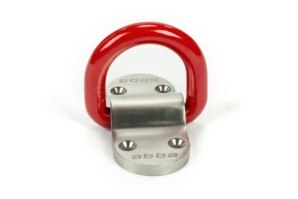 The abba S1 Ground Anchor is the ultimate choice in security for your motorcycle, bicycle, car, ATV, trailer, caravan and anything else you wish to chain to the ground. 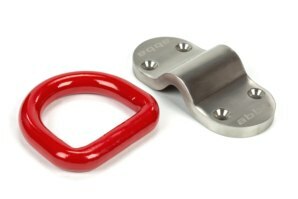 Our ground anchor uses an industry first, huge 20mm thick, one piece hardened steel shackle combined with a 12mm thick Stainless Steel base plate, which is pressed and CNC machined from one solid billet piece. Supplied with x4 chemical glass resin capsules and Stainless Steel bolts this forms an easy yet extremely secure fit. Not only does this anchor stand head and shoulders above anything else with regards to standard of materials used, it also has a striking look that just oozes class! The abba S1 Ground Anchor is made from the finest materials and is superior to any other anchor available on the market today. To back this up our anchor is Thatcham category 3 approved, giving it the highest approval available for a security device. Thatcham or "Thatcham Quality Assured" as it commonly known, is widely recognised amongst motorists for its testing and certification of vehicle security products. For a product to earn this certification it must first have satisfied the rigorous demands of Thatcham’s testing and certification process to meet the high standards and criteria set by the experts. Quite simply, if a product carries the Thatcham Quality Assured trademark – you can rely on it! Click here if you wish to see our Thatcham Quality Assured certificate. Click here if you wish to learn more about Thatcham and their product assessment process. Why A stainless steel base plate? A common problem on many ground anchors is that after just a few times of passing a large heavy chain through or across the base plate the paint starts to chip or wear away from this area. This results in a bare metal finish causing the unit to rust prematurely and look unsightly. Our stainless Steel base plate will still look like new time after time. A further common issue for the average ground anchor is the shackle and base plate often corrode after time as the paint finish wears away from the two parts rubbing together. This often causes these two parts to bind up, become rusty, unsightly and difficult to use. With abba's Stainless Steel base plate this can never happen due to the material's anti corrosion properties. This will allow years of hassle free use even when used in extreme outdoor conditions. Our anchor system uses chemical glass resin capsules to secure the anchor to the ground. These resin capsules are becoming very popular within many industries from building to aerospace because of their ease of fitting and extreme strength when fitted. They allow the average home owner to fit the ground anchor with general DIY tools. The drill bit supplied will fit virtually any DIY drill. (Expanding bolts would often require a large 16mm+ diameter drill that would need more professional equipment). Resin capsules have the added benefit of being able to be fitted at the very corner of a garage/shed floor. An expanding type bolt would often cause the edge of the concrete floor to crack or split due to the expansion pressure thus causing a weak setup and possible damage to the sub floor. X1 - 20mm Diameter one piece, fully welded hardened shackle. X1 - 12mm Thick Stainless Steel polished base plate. X4 - High quality, extreme strength glass chemical resin capsules. X4 - Stainless Steel Countersunk bolts. X4 - Anti attack ball bearings. X1 - Fully hardened masonry drill bit. X1 - Dust blow flexi tube. X1 - Straight shank hex key (Used with drill). Huge 20mm diameter hardened shackle. Powder coated for a durable finish. Similar anchors available would be using a considerably smaller diameter shackle allowing them susceptible to bolt cropping. The shackle is formed from "one" solid piece of material, allowing it to be stronger and have smooth rounded corners. The two ends are fully welded (under the bridge) meaning a potential thief would need to cut the shackle not once but twice to separate it apart. 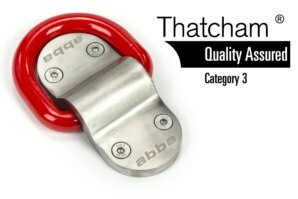 Thatcham Quality Assurance - Don't just take our word for it, the abba anchor has the backing of the industry experts! Its low profile when not in use and smooth edges means it can be safely ridden over by your motorcycle or car and will not damage tyres. Can be fitted to most concrete garage/shed floors with just general DIY tools and the hardened masonry drill bit supplied. 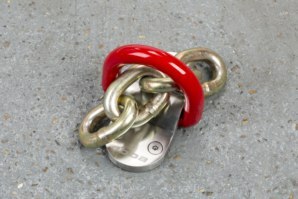 The shackle loop diameter is large enough to accept even the largest motorcycle chains. Supplied with high quality extreme strength glass resin capsules. Can be fitted to floors and walls. Suitable for use with any motorcycle, including Sports, touring, naked, custom, motocross, trail, scooters and more. 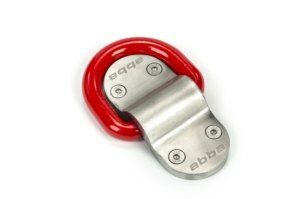 Also great for securing trailers, boats, caravans, bicycles and much more. Supplied with a straight hex key bit that will fit into any drill to allow the bolts to be spun fast into the the resin capsules. This will ensure the two resin chemicals mix thoroughly. This can also be used as a punch, to insert the anti attack ball bearings into the bolt heads. Supplied with everything you need (apart from drill) to fit by yourself. Including: drill bit, resin capsules, bolts, hex key etc. Low line profile and sleek look will complement your pride and joy. Installation is very simple providing you have basic knowledge of using power tools. 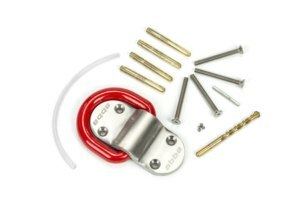 The resin capsule securing system is considerably easier to install than the average expanding bolt system commonly used. Everything required to complete the installation successfully is included in the kit (with the exception of a hammer drill). Note: The hardened masonry drill bit supplied may not be suitable for some (more commercial grade) concrete floors. Can it be fixed inside a Van or to a metal surface? Yes, we offer a kit which includes high tensile bolts and security sheer nuts instead of the resin system. If this is something you require please contact us by telephone (01245 322331) to purchase and we will include the required fixings for your needs. Do you offer any other fixing kits? Yes, as above we offer a kit for fixing to a van or metal surface. We can also supply the anchor with an expansion bolt (sleeve anchor) fitting kit if preferred. However for average/good quality concrete floors or walls we recommend the standard resin capsule setup for ultimate strength. What size chain can be used? Virtually any motorcycle chain. Even the largest 19mm link chains can be used. For reference the internal size is 42mm high x 75mm wide. Does the abba Ground Anchor come with a guarantee? 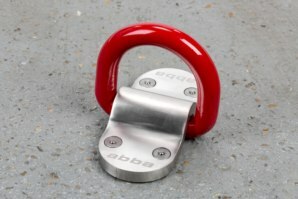 Got a Question about the abba S1 Ground Anchor? If you would like to ask us a question about the abba S1 Ground Anchor, simply fill in the form below and we will contact you within two working days. 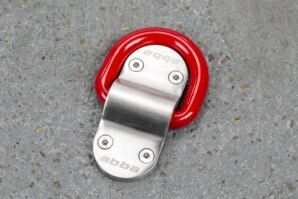 Want to tell a friend about the abba S1 Ground Anchor? Alternatively fill in the form below and we will send an email on your behalf to your friend, with a link to this page all about the abba S1 Ground Anchor.